My Mom recently changed everything I knew to be true and sacred about my all time favorite go-to food for healthy and sustainable nourishment throughout the winter months. You may have read my first posting on this blog on my LIGHTENED UP PORTUGUESE STYLE SOUP. I had always thought that beef was an integral component of this recipe, but as my Mom explained, as a child she actually grew up on a meatless version of essentially the same soup! You see, my parents immigrated to the US from Portugal as teenagers. When they were kids in Portugal meat wasn't as readily available as it is today in developed countries. A meatless version of traditional Portuguese Soup was something they ate on a daily basis for lunch or dinner, often times accompanied by some locally-caught fish. Only on rare occasions was beef and/or chourico added for flavor. In fact, it was only after moving to the United States that they began to integrate meat into the recipe on a regular basis. Intrigued, I asked my Mom if she would be willing to take a walk down memory lane and re-create the recipe. So, last Sunday Mom and I spent the whole morning (and part of the afternoon) cooking up a large pot of the meatless Portuguese soup that she remembered from her childhood. The result: AMAZING!!! This meatless version was just as good if not better than the soup I have been enjoying my whole life. Its my new staple totally delicious and 100% guilt free. Fill a very large pot with water and set on a high flame. Add beans, crushed red pepper, and 2 tablespoons kosher salt. Bring to a boil then reduce heat and simmer for 2 hours. Meanwhile coat the bottom of a small sauté pan with olive oil. Sauté onions and paprika over medium heat until caramelized (this can take at least 20 minutes). When onions are done stir in garlic and cook for one additional minute. Remove from heat and set aside. After the beans have simmered for 2 hours stir in the barley, carrots and potato. Simmer for an additional 2 hours. Add the onions, cabbage, collard greens, and mushrooms to the pot. Simmer for approx. 20-30 minutes until the collards are fully cooked and no longer tough and bitter. OMG! Thank you! Since my grandmother passed away, I've been craving this soup but haven't made it because of the meats. I'm definitely going to try this version. 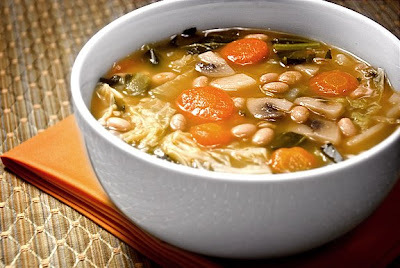 And, as you know, most Portuguese soups contain the same base (linguica/chorico, onion, kale, garlic) but different main ingredients (beans, veggies, chicken, etc.). So, I'm hoping I can translate my Granny's soups into meatless versions. YUM. Hi Melissa, I was thinking of making some soup so I went to your site (it's the first one I thought of :-)) and came across this recipe, which I had originally missed. Love the story you posted with it. Can't wait to make it.